Charging Dock is made by classic black soft silicone, durable, sturdy and can hold your apple watch and airpods securely and stablely. 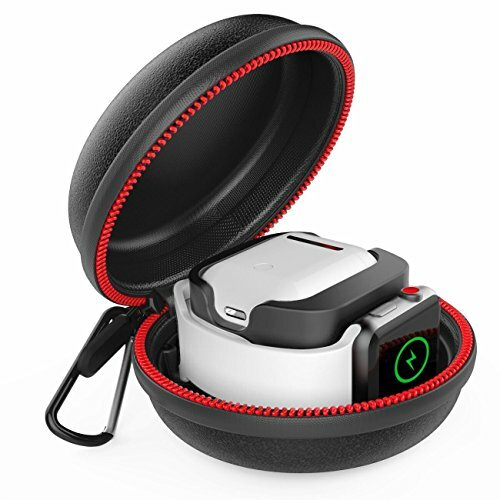 Carrying Case is made by hard EVA material with Zipper, which can protect your watch and Airpods from scratch and impact, provide them from a full degree. The most fantastic point and new design is that, an Airpods charging stand is added. Your AirPods case fits in top securely and a slot there to hold the case in place. Nice neat solution for anyone who hates cords everywhere, now you have a chance to end your messy life. If you have question, please feel free to contact us by e-mail. Premium Material. Exterior EVA Material Carry Pouch Case with Nylon interior, which keeps your Apple Watch and AirPods Charging Case from scratch and collision. Soft but durable silicone charging dock can hold your watch and airpods securely with a comfortable visual feeling. Flexiable and Convenient for Daily Use. The holder inside the case is removable, which makes it convenient to charge your Apple Watch and AirPods at different places. Your magnetic charging cable can be stored in the holder,sturdy and neatly. Perfect Accessory for Apple Watch and Airpods. Recommended for business trip, travelling and home storage, you can roll it up all inside when traveling. Equipped with a carabiner for easy carrying on your go. It can be easily attached to a belt or large bag. (Please note! Package in 1 docking and 1 travel case. Apple watch, Airpods and charging cable are not included.)!! !